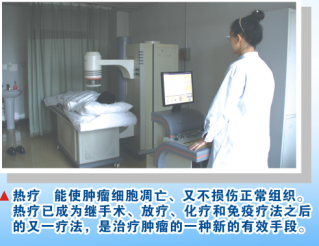 As a new technique for tumor treatment, the thermotherapy is regarded as the fifth method for tumor treatment after the surgery, radiotherapy, chemotherapy and immunotherapy. In the thermotherapy, the tissues are heated in a physical way to the temperature enough to kill the tumor cells (i.e. 42.5~43.5℃), which is then maintained for 60~120min to not only destroy the tumor cells but also not damage the normal tissues (safe temperature 45℃±1℃). It can kill the tumor tissues, improve the immunity of body, and inhibit the metastasis of tumors. It is well effective for the hydrothorax, ascites and pain caused by the cancer. Moreover, the combined thermotherapy with radiotherapy or chemotherapy can strengthen the efficacy. (1) Respiratory system: Pleural mesothelioma and lung cancer. (2) Digestive system: Pancreas cancer, gallbladder cancer, large intestine cancer, stomach cancer, liver cancer and esophagus cancer. (3) Reproductive system: Ovarian cancer, cervical cancer and testis cancer. (4) Urinary system: Urocyst cancer and kidney cancer. (5) Endocrine system: Thyroid cancer, breast cancer and prostate cancer. (6) Blood system: Malignant lymphoma and lymph-node-metastatic cancer. (7) Chondrosarcoma, fibrosarcoma, leiomyosarcoma, rhabdomyosarcoma, malignant melanoma, body surface tumors, peritoneum-metastatic cancer. (8) Refractory pain of advanced tumors. (9) Cancerous hydrothorax and ascites. (10) Prevention of tumor recurrence/metastasis. (11) Prostatic hypertrophy, prostatitis and rheumatic arthritis (at a significant efficacy).